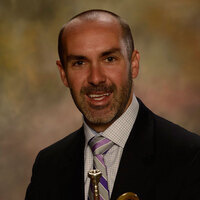 Dr. Mark DeGoti is Associate Professor of Trumpet at Auburn University. At Auburn, he teaches applied trumpet students, brass methods, leads the AU Trumpet Ensemble and Brass Ensemble, and coaches the Dean’s Brass Quintet. Prior to joining the faculty at Auburn, Dr. DeGoti taught at Eastern Illinois University in Charleston, IL for five years, and served on faculty at the Blue Lake Fine Arts Camp in Michigan in 2008. Dr. DeGoti has maintained an active performing career while teaching. He performs regularly with the Colorado Symphony Orchestra and McCall Music Festival Orchestra, and has performed with the Columbus Symphony Orchestra, Charleston Symphony Orchestra, Illinois Symphony Orchestra, Owensboro Symphony Orchestra, Peoria Symphony, and the Auburn Brass Trio. He has also collaborated with artists such as Leanne Rimes, The Tommy Dorsey Band, The Indianapolis Chamber Brass, and The Michigan Brass. As a soloist, Dr. DeGoti has performed at numerous universities in the U.S and abroad, with a recent appearance at São Paulo Trumpet Academy in Brazil. He can also be heard on several recordings with the Owensboro Symphony, as well as on the Klavier Records label with the Philharmonia Á Vent. An advocate of expanding the trumpet ensemble repertoire, Dr. DeGoti has published several trumpet ensemble arrangements through JPM Music Publications. Most recently, the AU Trumpet Ensemble performed his arrangement of Mozart’s Magic Flute Overture at the National Trumpet Competition Semi-finals hosted at Messiah College in Pennsylvania in 2014.